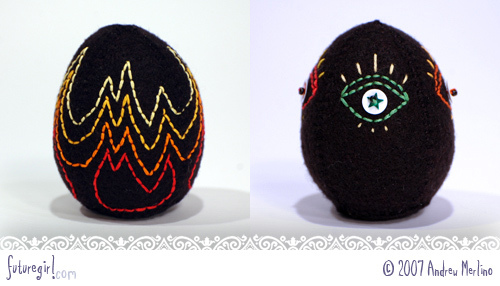 I'm so excited about completing another pattern, which you can now get on the free downloads page. 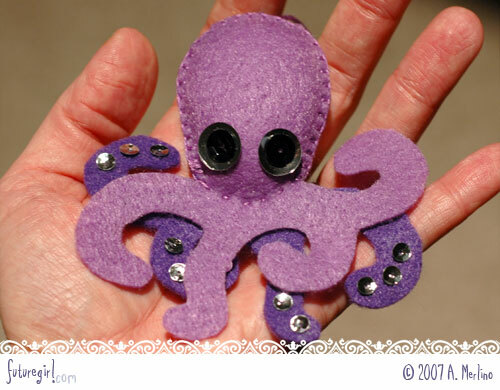 I designed the octopus in April, and he languished on my craft table since then. 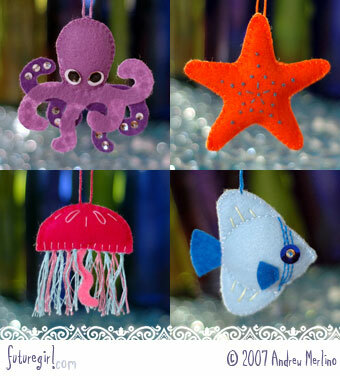 Just last week, I decided to re-do my starfish pattern and add a jellyfish and fish to the group. 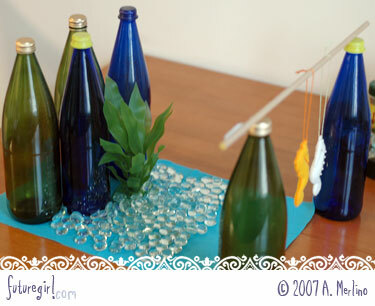 They are all easy-to-make and perfect for customizing. 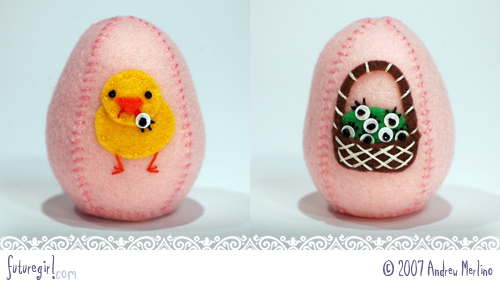 There's lots of room for experimenting with color combinations and embellishments. I think an all-white set would be really cool, too. There are a couple extra photos in the Futuregirl Supercute Sea Creature Flickr group. 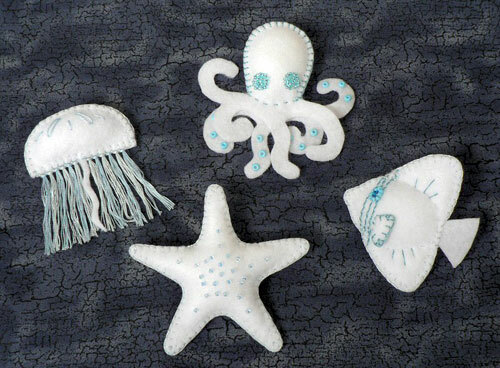 Each creature is between 3 and 4 inches tall and wide, which makes them the perfect size for ornaments, package tags, or clip-ons for backpacks. Yay! I can't believe how fast I finished up the pattern and all the web changes I needed to make. 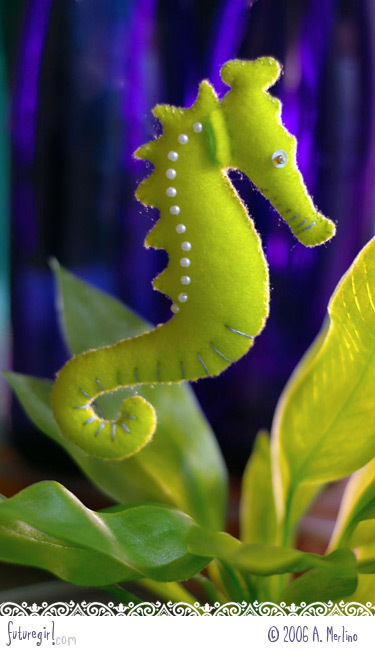 The PDF includes the pattern pieces and instructions for both an adult and a baby seahorse. They are super cute, if I say so myself. 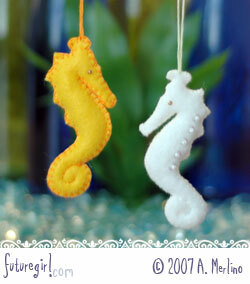 You can check out the seahorses made by my awesome testers in the Futuregirl Seahorse Stuffies Flickr group. Thank you so much Korallin, Diane, and Sara! I should have mentioned in my last post that Andrew is the genius behind the seahorse photos. He's the one that knows how to light things, knows how to position things, and knows how his camera works ... you know, everything. I've learned a ton from him since I started this blog. We always have so much fun setting up the elaborate photo shoots together. He's the best and I'm so lucky he's mine! 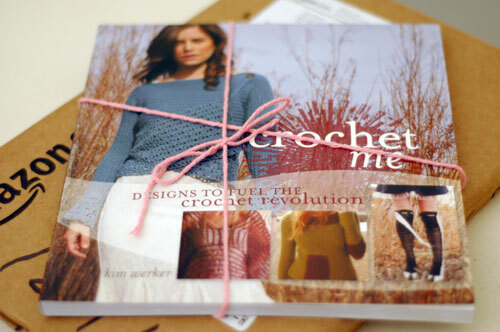 Last night after I posted, I tied my copy of Crochet Me closed. I'm totally serious. I didn't just do it for the blog. I haven't even opened it once - not once. I think if I hadn't tied it closed, I would have been crocheting today instead of finishing up the pattern. Now I'm so excited to get started on swatching! I'm *this close* to finishing the pattern and instructions for the my seahorse stuffies. 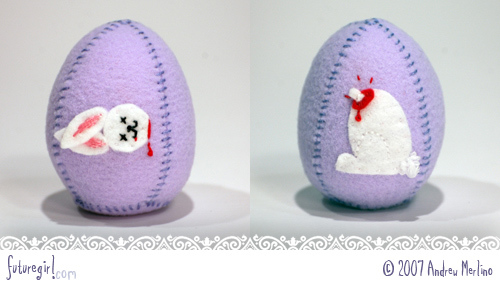 I know I shouldn't say anything before it's ready, because I'm totally jinxing myself, but I'm sure it'll be up soon! I'm including the pattern and instructions for both adult *and* baby seahorses. 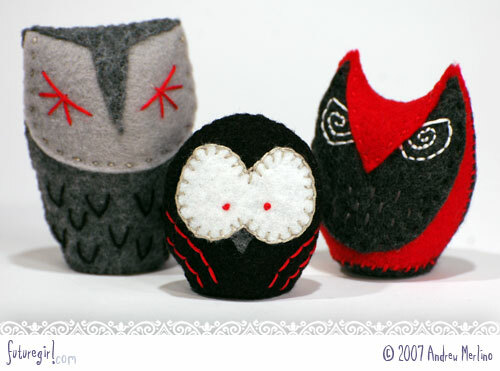 The adult pattern looks just like Sasha and the baby pattern is what I used to make the two little cuties pictured here. The only thing holding me back is that I just got my copy of Crochet Me in the mail and I'm fighting the urge to start swatching for the Icelandic Cowl. I've decided that I'm going to use every bit of my will power and not open the book until I have the seahorses finished and posted. Sasha is made of Limbo Lime felt, plastic pearl beads, periwinkle floss embellishment, and eyes made from a white sequin and a cooper-colored bead.